Compañera and compañero comandantes, compañera and compañero bases of support, militia, and insurgentes. Compañeras and compañeros of the Sixth. Good morning, good afternoon, or good evening to all of you, wherever you may be. Through my voice speaks the voice of the Zapatista Army for National Liberation. Through my voice speaks the pain and rage of hundreds of thousands of indigenous people, men, women, children, and elders of the Zapatista Army for National Liberation. We are here with the compañer@s of La Realidad, to support them with all of our dignified rage. 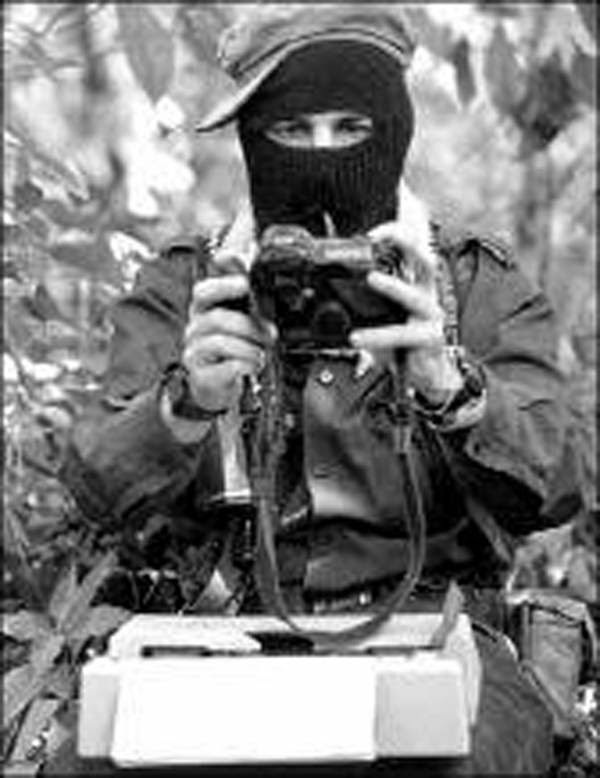 The compañeros and compañeras of the Sixth must understand something: the EZLN cannot involve itself in the affairs of the communities and the autonomous governments anytime it wants to. 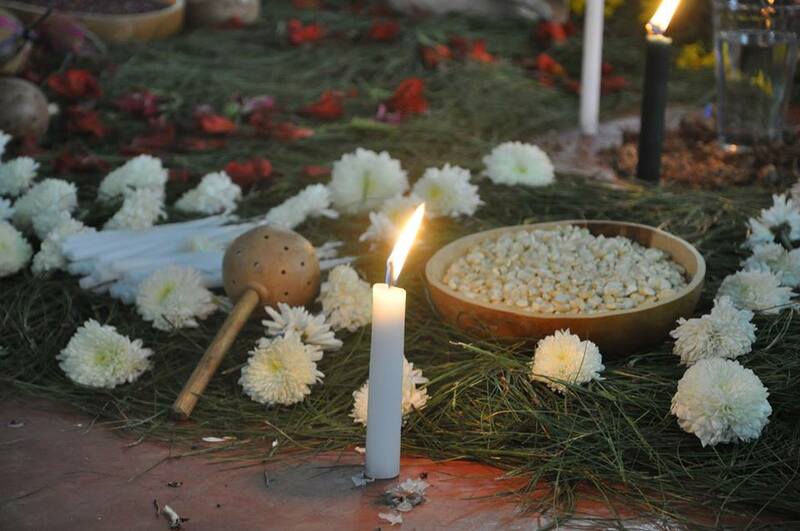 Because when we as the EZLN say “respect,” it isn’t just talk, it is our practice. The EZLN, as a force of the people, can only become involved in an issue in the Zapatista communities if the autonomous authorities request this. This is so because an army, of whatever kind, should always respect and serve the people, the civilians. 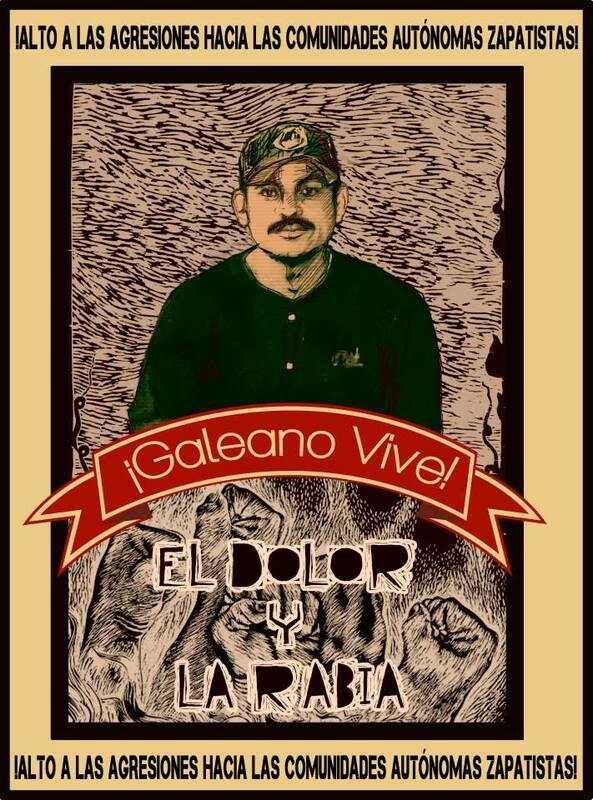 When we learned of the cowardly and cruel assassination of our compañero Galeano, we were filled with pain and rage. But we cannot just do whatever we want in response; rather, we must respect and obey what our people say is the road that we must follow, and what we as the EZLN should do. The respect that we speak of, as the Zapatista Army for National Liberation, is how we interact with the Zapatista communities and autonomous authorities, and that is why we had to bear the rage and the pain that we felt. It was not until the Junta de Buen Gobierno of La Realidad requested our presence, saying “we have come to the point where we would like the comandancia of the Zapatista Army for National Liberation to intervene in order to assure justice is done in response to the attack and murder of one of our own and against our Zapatista organization.” At that point, we could then come. 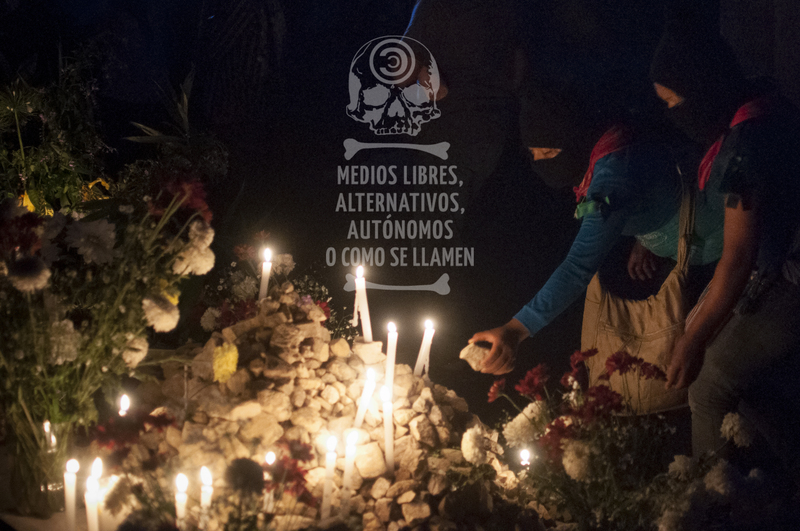 With all of our rage, we came to accompany the compañeras and compañeros, to be with them, and to investigate this cowardly assassination, because these contras—anti-Zapatista paramilitaries—have gotten what they have because of us. They pass themselves off as Zapatistas, and ask for [government development] projects by saying that they are Zapatista representatives. We know who they are, we know who the bad government talks to, and the foolish bad government believes that they are actually speaking with us. We don’t accept the leftovers from your table. We aren’t looking for crumbs, nor will we accept them. We seek to govern ourselves with our peoples of Mexico, with Justice, Liberty, and Democracy. We Zapatistas are not the ones you are talking to. We do not talk to the bad government, today or ever. We do not have the slightest trust in those with no brain. To us, it doesn’t matter what the idiotic bad government does, or that it is fooled by a bunch of sellouts, because that is how bad governments are: ignorant and stupid people who don’t have a good mind for governing, only big hands with which to steal. That is how it is with the municipal presidents, city councilmen, Manuel Velasco [governor of the state of Chiapas] and Peña Nieto, All of them, from whichever party, are ignorant people who only come alive when there is something to steal, and then they fix themselves up nice for photos with the paid press. This is what we endured for more than 71 years of the PRI and 12 years of the PAN and now the PRI again. On top of this we’ve observed local government where the Green Ecologist Party [PVEM], the Party of the Democratic Revolution [PRD], the Workers Party [PT], the Citizens Movement [MC], and others make themselves present, but they are all full of professional politicians. The rage that we have is against capitalism. Because what they did to compañero Galeano was the work of capitalism and they would have done it to anyone; they would have murdered other compañeros from this community because that is how the bad government had plotted against our organization, the EZLN. When we see compañero Galeano, we see the assassins, and we also see who is behind them. It is Velasco, and the person behind Velasco is Peña Nieto, and behind that national sell-out Peña Nieto is big capital, the true savage criminal of neoliberal capitalism. Now they are washing their hands of it. Or they will wash their hands of it; this talk about how they already arrested so-and-so is a diversion. Because they don’t detain these people in order to seek justice and punish the murderers, but rather to try to calm the great wave of pain and rage that has arisen across the world. That is, they do it to pacify people like you,compañeras and compañeros of the Sixth, and students of the Zapatista Little School across the world. Because they’re the ones who organized everything in order to do this to us, that’s how this works. One Florinda Santis, anti-Zapatista, from here in La Realidad, is the PAN Councilwoman in Margaritas. It was her and others who called them [the assasins], offering money from the bad government. This Florinda schemes with the peace commissioner; they meet with the ex-governors, the municipal president, the state government, representatives and senators, and the federal government. They had been planning together for a long time; that evil Luis H. Alvares would meet with Florinda and Carmelino, so that they could carry out this cowardly and cruel paramilitary work with these sellouts from La Realidad. And so through these various parasites they planned the attack, and at the end those who will carry it out are these people from La Realidad who don’t even realize how they are being used. And that was how it happened. Because she knows which people are no longer Zapatistas, and those are the ones who she called to mobilize, and since she is councilwoman she works with all of the governments. She took these people to see the government who showered them with money and projects and weapons, and we see that they are even more ready to make trouble when they know they have the support of the bad government. And now that the assassination has been committed, that same Florinda is going to fool them again. The bad government needs to clean up the criminality so that it doesn’t appear that they planned, organized, and financed everything. So they make like they have arrested the assassins, so that it doesn’t look like it was the government itself. But the truth is that it is them, like a thread or a chain, one behind the other: Councilwoman Florinda, leaders of CIOAC, the municipal president, the governor, and ex-governors who already confessed that they gave money to the paramilitaries and who were very quiet before and are now talking, but only in order to defend the criminals. And it is also certain that the new peace commissioner is mixed up in this, the one who had sent people to give money and support to the leaders of the EZLN in exchange for information about whether Subcomandante Insurgente Marcos was very sick or had already died, though you have seen with your own eyes if Supmarcos is very sick or dead. The deputies, senators, and federal government all do this; all of the forces of the bad governments can be found in this criminal attack. And there are people who say they are on the left, progressive and democratic, who also supported them in this plan. The bad government’s plan is to assassinate the Zapatista Army for National Liberation. The bad government wants us to be like them, they who are stained with the blood of a compañero in struggle, who never sold out, never gave up, never strayed from the struggle. Because these deceitful, manipulative men and women obey the three levels of bad government, as they themselves admit. When they carried out this murder they said, “come women, bring us something – machetes, sticks, rocks – to support our men. Remember what the government said, that this is why we are receiving the ‘Oportunidades’[i] programme.” That is what they shouted, that is what they said. The bad government wants us as indigenous people to kill one another. They want us to lose our minds, to become even more crazy than they are; they want us to be assassins like them, so they can tell the sell-out media—which they themselves bought—that this is an intracommunity problem. That is what the bad governments want, so they organize people and tell them, “kill the Zapatistas, on whatever pretext you can find, so that we can divert them from their struggle for national liberation.” Their plan is to assassinate us, bury us, and get us to kill each other. And they will continue to try to do so again and again. Because they say that they are going to take the caracol, and that they will do the same in any one of the caracoles. 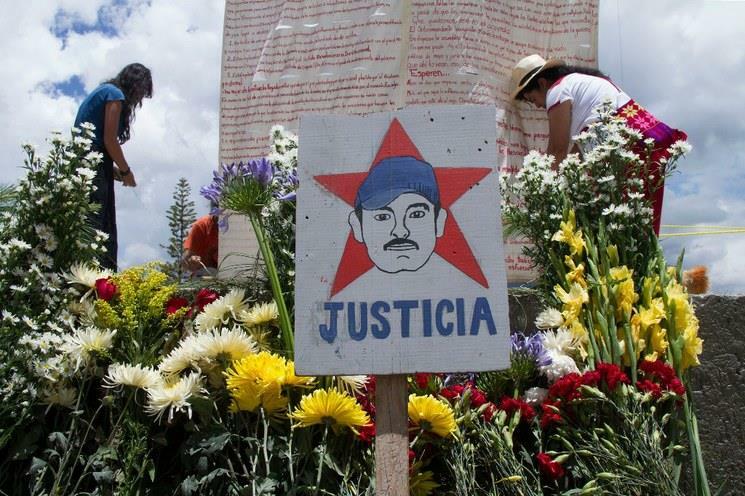 They thought that with the assassination of compañero Galeano they would stop our organization’s struggle, but NO. That is why we are here, to make clear that the Zapatista struggle IS NOT OVER. They want to put an end to the example of our struggle. And they think that they will scare us by killing us. We know exactly why we are willing to die if necessary. Just like the compañeros who fell in 1994 knew exactly why they died, and we continued our struggle then. And that is how and why Compañero Galeano continued on, doing his duty, like the fallen compañeros. And so now we will continue the example of compañero Galeano. It is because of these fallen compañeros that we are an example in Mexico and in the world. Our principal obligation as the EZLN is to the Zapatista communities, our compañero and compañera bases of support. If they have a problem, the first thing that we do is try to support them. We do not tell them that we will come another day, or that later we will look into it, or make any other excuse. This is why we suspended the exchange with the compañeros of the National Indigenous Congress and the homage for compañero Luis Villoro. We cannot be in two places at once. We cannot see to this grave problem and at the same time be attending to the thousands of people from all over the world who were going to come to these encounters. And so we had to choose and we chose our people. We came to la Realidad, home community of compañero Galeano, his family, and his compañeras and compañeros, and home to their rage and pain. As compañeros and true Zapatistas we must be with the compañeros, so we postponed other work. We aren’t out traveling around, abroad for example, giving talks. Because the most important thing for us is the compañer@s of the communities. They are our strength, our sustenance, our destiny. We have come to unbury Compañero Galeano. In a little while you will see how. And these people who killed him are alone. They are stained with the clean and pure blood of a man in the struggle, and this they will never be able to wash off. They are doing the devil’s work of Peña Nieto and Velasco, of the demons of neoliberal capitalism. They are obeying the orders of the supreme paramilitary commanders, Peña Nieto and Velasco, who pursue and persecute the people, the women and men who struggle. They persecute the güeros[ii] who struggle, because there are güera and güero compañeras and compañeros who are also below and to the left. We are going to bury, little by little, this capitalist system, which is unjust, rotten, decrepit, unequal, and already stinks and contaminates the entire world like a plague. We are thousands and thousands of Zapatistas. Right now, there are compañeras and compañeros in the other caracoles paying homage to compañero Galeano because they could not come all the way here. There are also compañeros and compañeras mobilizing and protesting in different parts of Mexico, in different cities, and in other countries. They see that what we are constructing is an alternative; they see that it is a new kind of system, a new world. They realize that yes, we are anti-capitalists. This is why they used such cruelty in the way that they killed compañero Galeano, because that is how they were told to do it. That was what the bad government of Peña Nieto and Velasco instructed and therefore what they had to do; that is what they are paid for. It is a terrible shame that there are people who are so screwed up and rotten in the head, who don’t think about their sons and daughters, who abandon them in order to work for criminals. Because there will be justice. The bad government does not respect us as indigenous people, they see us as dogs and they think that we are dogs; because of the way dogs bite each other and kill each other, depending on which one wins. We say clearly that we are NOT dogs. We are an organization that struggles for national liberation. We are anti-capitalists. We struggle for liberty, justice and democracy. We struggle for a better world, a world where all worlds fit. We are not going to allow this deter us from our path, which is what those bastards in the bad government want. What they did to our compañero Galeano pains and saddens us, but we are NOT going to dirty our hands returning evil with evil. Because what we fight for is Justice for the millions of human beings in this country, and we have wanted and sought justice for centuries. For centuries and forever we have sought justice, not like those capitalist ill-named governments, who don’t know what justice is, because they are the ones who commit injustices. We are going to continue the work that compañero Galeano left for us, and we are going to do it with the just and dignified rage that he also left with us; the people command and the government obeys. Just as he followed the example of our fallen compañeros in 1994, we must now follow his example, and that of any fallen compañero and compañera, whether they are authorities or not. We see many paths by which our people of Mexico may achieve their liberty. It isn’t as some say, that there are only two roads: elections or armed struggle. We have seen during these 20 years that dialoguing with these people who are selling off our patrimony doesn’t work. None of the three parasitic powers followed through on their word that was given in dialogue. The dialogue that has worked for us is with people from below and to the left, who are now the compañer@s of the Sixth and the compañer@s of the free and alternative media, some of whom are here and others who couldn’t come. This has served us, the dialogue with the people of Mexico and the world, listening and learning. And now this dialogue has reached thousands of compañeras and compañeros who have heard us through our little school. That is, between the authorities and the bases of support, we are taking turns dialoging with those from below and to the left. In the early days it was the authorities who did the talking with others, and today it is our compañeras andcompañeros of the communities who are in dialogue with them. This is the truth, compañeras and compañeros; we are helping everyone become good representatives. As we say, the people command and the government obeys. That is why we Zapatistas are not struggling to take Power, not for elections, and not for armed struggle. Rather, we struggle so that it is the people who decide their path, without political parties who deceive them and don’t respect them. And we are here to defend our communities. The people of the CIOAC, what do they do? Just the paramilitary work. And who does that serve? The rich, who defend those who exploit these same people, and who command their leaders, both at the state and national level where they say they work. It is certain that their state and national leaders were present for the planning of the National Crusade Against Hunger, and supported that initiative. Because that is where there is money to steal that should go to the people; what they actually give to the people is merely what’s leftover after their theft. That is how they live, and what their leaders live off of. It isn’t a plan for eradicating hunger; it is a plan for counterinsurgency. This is where all of the big and the small leaders learn to misguide the people, where they learn to be gangsters, swindlers, and manipulators. Listen to what the CIOAC is: the CIOAC from the community 20 de Noviembre attacked the compañeros from the community of 10 de abril in the Caracol of Morelia a few months ago. About a year ago, the CIOAC invaded the recuperated land adjacent to the compañeros of the caracol of La Realidad. About a month ago, the CIOAC attacked and shot at the people from Gpe los Altos along the Euseba river. Also about a month ago, the CIOAC attacked and shot at the people from San José las Palmas near Las Margaritas. About 15 days ago, the CIOAC clashed with the people from the Ejido Miguel Hidalgo in the municipality of Las Margaritas. The CIOAC clashed with their own people from the municipality of Rayón in the north of Chiapas, resulting in various deaths. On May 2, the CIOAC ambushed the compañeros of La Realidad, cruelly assassinating the compañero Galeano. This is the CIOAC: paramilitaries, led by the paramilitary leaders the Luises, with Peña Nieto and Velasco as their supreme leaders; it is because neoliberalism is their master that they follow the orders of these people. And so we ask, what future do the people of CIOAC teach to their children? To be paramilitaries? To be assassins? To kill their own people in exchange for money? This is what the bad governments have planned, and they will continue with this plan in all of the caracoles. They are prepared [to act] against us because they are realizing that their life as bad governments and as this system is running out. That is why they will do such brutal things against us as Zapatistas. Here in La Realidad, the bad government developed and implemented a plan to try to assassinate the EZLN, because we, men and women, are building a different SYSTEM OF GOVERNMENT, against the bad capitalist SYSTEM. For them, we are the principal enemy, and the truth is that we are in fact their enemies, because we say that enough is enough! And alongside our cry of “enough is enough” is our practice of leading by obeying. Here the people govern, not the government; those who are in the government serve the people. That is why these bad governments plan, organize, and spend millions on this project; they buy people off to come and kill us. That is why we should make no mistake: the enemy is the one above; until we bring it down there is no way to stop it. The deceived assassins, yes, they will face justice. We will explain all of this further. We will not take revenge against these people; we will take our revenge against capitalism. The truth is that we don’t know how to speak Spanish well, how to write well, or how to read books. And there are books that are good and others that simply aren’t; instead of guiding you they confuse you. But what we do know how to read is the bad, horrible situation that we are living, as Mexicans in this country, and others in other parts of the world. We read and think about this situation, listening to the people from below and to the left, and this reading makes us think, what would a better life be like? That is to say, a better, other, system? With much effort we try to speak Spanish in order to awaken those from below and to the left, to share our idea about the construction of a way to govern ourselves in the countryside and in the city. To show who we are and to learn from the example of the struggles of others. Some people try to show their knowledge by writing a lot, but they didn’t learn anything in the state department of education. All that they learned there was how to put pens in their shirt pockets. But we write with the example and through the practice of our compañeras and compañeros, who now of course know how to write because they have built their autonomous schools. That is why we say that it isn’t a problem whether or not we know how to write in Spanish, or whether or not we know how to read Spanish, or if we know a lot of Spanish or just a little, because we find a to launch our thinking and our practice and then we correct and improve as we go. That is how the Zapatista compañer@s bases of support write in practice, through their creation of a new system of government, against the bad system. That is the truth, compañeras and compañeros of the Sixth. We may not know where the commas, accents, symbols, and all that go, but we do know what new system we need in this country. Isn’t that right, compañeros, compañeras? Compañeras and compañeros of the Sixth, let’s struggle, work, and discuss amongst ourselves, those below, men and women. Let’s not look above anymore, where there are neither eyes to see, nor ears to hear, and where there is no respect. Look, it’s like in the paid media, if you look there for information about the bad system in this country you won’t find anything, because they don’t talk about anything there. But every day, they print the bad government’s news and reports because they are paid thousands of pesos to do so. They say that Mexico is improving under this government and when you turn to look from below, to see if it is true what they say in the well-paid media, it turns out that it is quite the opposite. And so, you have to look below. That is, if we want to know how other brothers from other places struggle, we have to go and read and listen to the alternative or free media, the “listeners” we call them, because they listen to and take what those people say without changing anything and send it to other places so that others, like we Zapatistas, can learn from other struggles, so that we can listen to them and support them. So, onward, compañeros from the independent media below and to the left. For instance now, if we want to know how or what our compañer@s of the Sixth are doing, we can only find out through the alternative media. There is nothing about them in the paid media. Why? Because this type of news doesn’t pay, and that’s how it is even for those that are very much on the left and revolutionary, and then there are some who have one foot here and one foot there, but oh well. Dignity is what is missing. It Is through the alternative media that we have learned about the mobilizations by the compañeros of the Sixth, where [from where they are] they embrace the family of compañero Galeano, where they send greetings and embrace the compañeros of La Realidad, with dignity and rage, both in Mexico and in other countries of the world. And that is how we already know about the mobilizations in all corners of the world to support and embrace the family and compañeros of compa Galeano. In Mexico, there are many other protests in the cities and many other forms of protest on the pages of the internet and twitter, as they call it, where all of the world can meet. Compañeros, we are all here in La Realidad because of the reality of what the bad governments did: they want to kill us, destroy what we are building here in La Realidad. So we say to the bad government: the Zapatista people of La Realidad will never allow you to destroy us, and that one day what we are constructing here in La Realidad will be a reality in the entire country. If you could not do away with us on the morning of January 1, 1994, you certainly won’t be able to do so now. Because our commitment is to liberate this country, whatever happens, no matter the cost, and come what may. May 2014, La Realidad, for the reality of this country and may it one day be a reality for the entire world. Today, in the twentieth year of the war against oblivion. [ii] Güero is a term used in Mexico to refer, often affectionately, to phenotypically white people.